Final Nudge made it 3 wins from just 5 starts over fences on Saturday when he landed the Betfair Cheltenham Preview Novices’ Limited Handicap Chase at Newbury for owners Corbett Stud. Final Nudge made his chasing debut back in November 2016 where he duly won the Weatherbys Racing Diaries Beginners’ Chase under Adrian Heskin. He was then placed 3rd on two occasions at Newcastle & Catterick before finding himself back in the winners enclosure at Hereford next time out, this time with Gavin Sheehan doing the steering. Again with Gavin Sheehan in the plate, Final Nudge headed to Newbury on February 11th just 10 days after his Hereford victory, where this time he was carrying top weight. Always in a handy position throughout the race, Final Nudge joined long time leader & eventual 2nd placed Lessons In Milan and stayed on strongly all the way up the run-in to take the lead close home and win by 1 1/4 lengths at the line. Final Nudge has been running very consistently all season now and provided that he continues in the same vein throughout the coming weeks there could well be further winning opportunities for him should he remain in novice company but a possible tilt at the Midlands National at Uttoxeter on 18th March wouldn’t be out of the question. 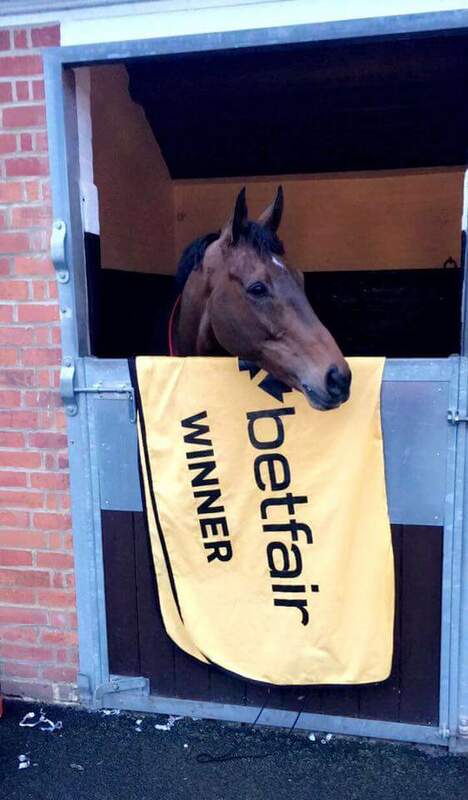 Final Nudge (above) looking very proud of his Betfair winners rug after his win at Newbury last Saturday.